Sir Winston Churchill once said "We make a living from what we get, but we make a life from what we give." It's an honor and privilege this Christmas to 'tip my hat' to an exemplary friend of nature -- the legendary Bob Barker. A 50-year career on television with the longest running daytime game show 'The Price is Right' is certainly remarkable. But there's another side to Bob Barker beyond his successful daytime job that is astonishing and brought an ear-to-ear grin across my face. He truly loves animals, "I am one of millions of people who was just born with a deep love of animals. I have been devoted to animals since I can remember. As a kid I picked up strays and tried in my clumsy ways to help injured animals. I've done it all my life, and now I'm doing it on a much larger scale," says a spritely Barker. Barker who hails from Washington the Apple state has a nimble mind and sharp focus as one might expect from a man who holds a black belt in karate and trained rigorously with Chuck Norris. He also possesses an exquisite sense of humor and Bob Barker is a benevolent gentleman. Perhaps the fact that he's 1/8th Sioux gave him an advantage of being that much more 'hardwired' and sensitive to the Earth and its animals. Though he credits his dear late wife Dorothy Jo for turning him into an animal advocate. And make no mistake Bob Barker is global in his love, determination and splendid achievements in standing tall and protecting the Animal Kingdom. Barker has testified before the U.S. Congress to ban elephant traveling shows. His tireless advocacy on behalf of the Animal Kingdom in South America helped pass a bill against using animals in circuses in Bolivia. And he picked up the tab to send 84 lions from circuses from Bolivia to the U.S. after the bill passed. "I went to Denver to welcome the lions and they're in a sanctuary there now. I felt just as joyous at the slight of those beautiful lions as I did when I saw those elephants," said a jubilant Barker. This year (2013) Barker footed yet another $1M bill of moving three elephants from the Toronto Zoo to the Performing Animal Welfare Society (PAWS) sanctuary in California. In fact, one of his all-time favorite memories is, "When I stood and watched those three elephants from the Toronto Zoo come off the bus and arrive at the PAWS sanctuary." He graciously donated $2.5M to People for Ethical Treatment of Animals for their stunning Los Angeles office on Sunset Drive. On yet another occasion, Texas-based Wildlife Reserve & Rehabilitation reached out and asked Barker for $5,000 for an avian ventilator, but instead they received a gift 50 times larger. Lynn Curry, the founder of the center remembers it like this: "Mr Barker placed a personal phone call to me and said he was sending $250,000 to support the purchase of the ventilator as well as many other things we need for all the animals we rescue." The center receives over 5,000 animals a year at their 187-acre facility. Barker is a strong believer in education and knows that the only way to assure a better future for the Animal Kingdom is through excellence in the field of law. So he gave $1M to Georgetown University to support the study of animal rights. At his alma mater, Drury University, he created an animal ethics program with a donation of $1M. Then, a couple buildings away, he established a professorship in animal rights with another million-dollar donation. Post 9-11, Bob Barker's philanthropy also generously touched our Armed Service men and women. He donated $2M to Semper Fi Fund and personally helped 1,000 wounded and critically ill Marines, sailors, soldiers and their families. Barker became a vegetarian a long time ago. "I became a vegetarian out of concern for the animals and I was a vegetarian for a very long time before I realized that many people do it out of concern for their health. Furthermore, the answer to enjoying life is nutrition. I recommend that you become a vegetarian and exercise if you want to enjoy the golden years," says a fit and active 90-year-old Barker. The story that moved me the most was his stalwart efforts to protect our ailing oceans from despicable poachers. 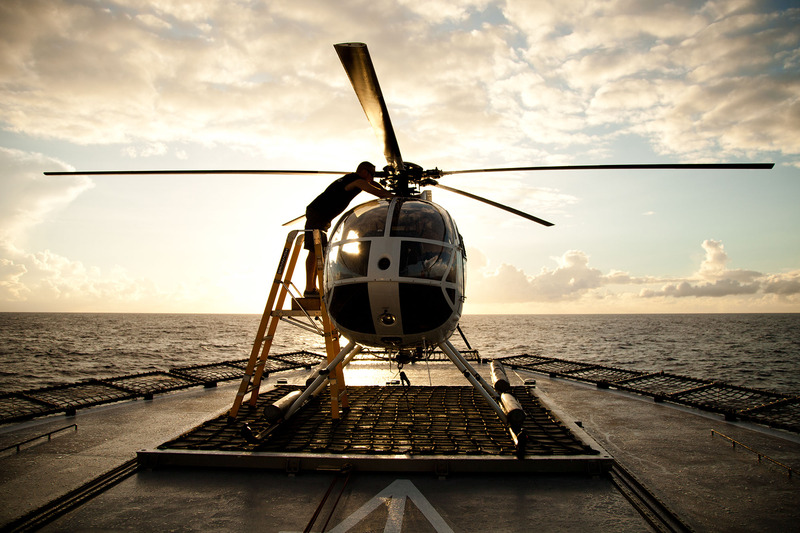 Barker is a long-time supporter of Sea Shepherd Conservation Society and Captain Paul Watson. "I'm delighted to be able to help Sea Shepherd Conservation Society in its mission to end the destruction of habitat and slaughtering of wildlife in the worlds oceans. There's a lot of talk about preserving our ecosystems and species, but this is one organization that puts their words into action," asserts Barker. The Nisshin Maru rams the Bob Barker, pushing it into the Sun Laurel. 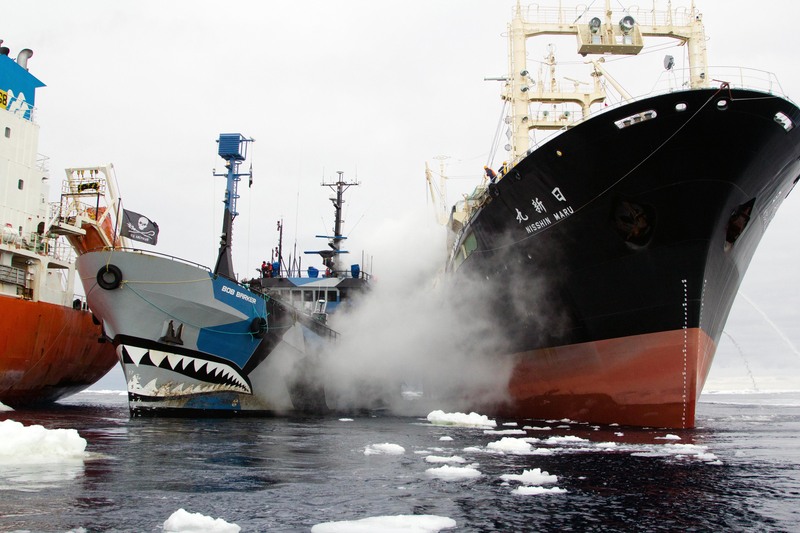 "When Captain Paul Watson told him for $5M he could end the Japanese illegal whaling," Barker responded, "I think you do have the skills to do that and I have the $5M, so let's get it on." Barker also procured the helicopter for the Bob Barker boat naming it 'The Nancy Burney' after the President of the United Activists for Animal Rights, another organization he supports. By the way, SSS Bob Barker, SSS Sam Simon and SSS Steve Irwin have just left Australian ports and begun the 10th year consecutively of protecting the Great Southern Ocean whales in an international sanctuary in 'Operation Relentless' from bloodthirsty Japanese whale-poachers, who are in violation of an Australian high court ruling. 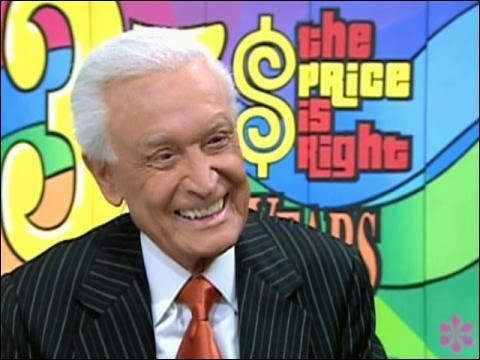 For 35 years of 'The Price is Right' Barker closed his shows with "Help control the pet population, have your pet spayed or neutered." The 'guru of spay neuter' is certainly doing it his way. His plan as he so delightfully revealed is to die broke. On behalf of all the Animal Kingdom and Armed Service men and women around the globe, we wish you a very Merry Christmas -- Bob Barker! Earth Dr Reese Halter is a broadcaster, biologist, educator and co-author of Life, The Wonder of It All.